Those who work in paramedic services and heath care at large, are well aware of the challenges, and in many cases, crises posed by changing demographics in Canada today. It goes by many names, the Grey Tsunami, aging of the Baby Boomers, the epidemiologic shift or transition. Regardless of the label, the strain placed upon health care workers by a system that is not responsive to the needs of an aging population is felt in ambulances, intensive care units, outpatient clinics and mental health units alike. In our prehospital world it seems there are never enough ambulances, furthermore, hospital administrators often view us as an unlimited resource whether it be for emergency calls or medically necessary transfers. In reality the problem is not with the advanced life support systems designed as a public safety net. This is evidenced by more and more paramedics being put on the road which does nothing to alleviate the gridlock experienced daily in emergency departments, and, more importantly, the bed utilization nightmare which plagues hospitals across the nation. It is obvious a new way of business is needed to ease this pressure and many novel models have been proposed and implemented utilizing paramedic clinicians. However, before we discuss solutions we need to look at why we are in the collective state we find ourselves in as a country today. Public health is often thought of in terms of core functions such as immunization programs, infectious disease surveillance, sanitation, etc. However, the health of the public is something paramedics impact daily both at the individual level as well as the system level. While paramedic clinicians are often involved in traditional public health functions (think flu clinics), we also are an integral part of the cardiac chain of survival, addressing the public health issue of out-of-hospital cardiac death. More recently, with the unfortunate increase in acts of terror and active shooter events, campaigns in the United States (www.bleedingcontrol.org) have focused on hemorrhage control. These are well-established areas that paramedic services possess domain specific knowledge and expertise in. Another, although less homogeneous, is chronic disease management. As the population ages, diseases of affluence have become increasingly more prevalent than the issues our health care system was designed to handle in the early to mid-1900s. At the turn of the century people largely succumbed to diseases of infectious or traumatic etiology. To paraphrase a prominent Canadian health policy expert, Dr. Michael Rachlis, our system was built for a battlefield and now we are fighting it. The epidemiology in our country has shifted over the course of the past 80-90 years, largely due to the fact that modern medicine has led to a substantial increase in life expectancy and has decreased infant mortality dramatically. As such, we are dealing with problems not previously seen in health care delivery. In light of the aging population and the fact that end-stage renal disease (ESRD) continues to increase at a rate of approximately 10 per cent per year it is apparent that there is an impact on paramedic services and the system as whole. Work is being done in Nova Scotia looking at the epidemiology of CKD in the context of paramedic services. The authors of the study found that 80 per cent of ESRD patients on hemodialysis had an encounter with paramedic services, with 91 per cent of these encounters being medically necessary transport to a dialysis unit. This equated to almost 11,000 encounters over five and half years. 4 An obvious burden on the system. A subsequent study by the same team looked at predictors of paramedic services use and transport to an ED. It was identified that patients who are increasingly frail, have central venous access and those with comorbid conditions are at risk for paramedic services usage. 5 Going forward work needs to be done on how to impact this population, including the treatment of their ACSC which may lead to subsequent hospitalization. CKD and its associated ACSC is just one subset of chronic disease which places a burden on the prehospital and health care system as a whole. Many systems have put in place efforts to expand primary care access and treatment of chronic conditions and ACSC. The EPIC trial in the Greater Toronto Area is looking specifically at the impact community paramedics are making on hospitalization of COPD, CHF and diabetes mellitus. 6 The extended care paramedic program in the Central Region of Nova Scotia’s EHS system deals with many primary and ambulatory care issues in the long-term care population, mitigating or facilitating appropriate transport to alternative destinations. 7 Finally, the Province of Alberta and Alberta Health Services should be lauded for recently announcing an 11 million dollar investment in community paramedicine in Edmonton and Calgary. There are pockets of investment and innovation in Canadian paramedic service dealing with chronic disease management. The few mentioned above are shining examples of success and there are increasingly more popping up across the country. It is time we recognize the Grey Tsunami for what it is, a public health problem, and paramedic services need to be viewed by the system as whole as innovators who can be integrated into the solution of this complex and burdensome issue. 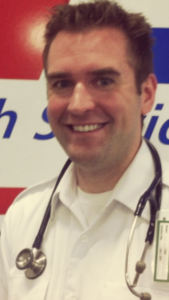 Ryan Brown is a Primary Care Paramedic based out of Sydney, Nova Scotia. He is a clinician, educator and researcher who holds a BSc (Honours) from Cape Breton University, a Masters of Public Health from the University of Liverpool and is a Fellow of the Royal Society for Public Health. Arora, P., et al. (2013) Prevalence estimates of chronic kidney disease in Canada: results of a nationally representative survey. CMAJ, 185(9), 417-423. Terner, M., Redding, N. & Wu, J. (2016) Increasing rates of kidney failure care in Canada strains demand for kidney donors. Healthcare Quarterly, 19(3), 10-12. Fink, J.C. (2016) Are ambulatory care-sensitive conditions the fulcrum of hospitalizations for CKD patients? Clin J Am Soc Nephrol, 11, 1927-1928. Bartolacci, J., et al. (2017) Predictors of emergency medical services usage by dialysis patients. Prehospital Emergency Care, 21(1), 102. Bartolacci, J., et al. (2017) The burden of emergency medical services care for dialysis patients. Prehospital Emergency Care, 21(1), 127. Drennan, I.R., et al. (2014) Expanding paramedicine in the community (EPIC): study protocol for a randomized controlled trial. BMC Trials, 15(473). Jensen, J.L., et al. (2013) Transport outcomes and dispatch determinants in a paramedic long-term care program: a pilot study. CJEM, 15(4), 206-213.